I did a fender eliminator pretty much 5 days after I bought the bike. I rode in wet conditions for the first time and the back of my bike, helmet, and jacket got covered in mud. I've got to wonder, is this because of the fender eliminator? I have no frame of reference for how bad it gets during wet conditions with the stock fender. Do you guys experience this too? What about with the stock fender? I was thinking about either installing one of the splash guards, or putting the stock fender back on. Is it really worth avoiding wet conditions just to have a fender eliminator? What do you guys do? Avoid rain? Deal with the dirt? Or am I over reacting and do the stock fenders do this too? I'm a new rider so I have no frame of reference. The splash guard doesn't have too many reviews so I'm guessing not a ton of people use these. 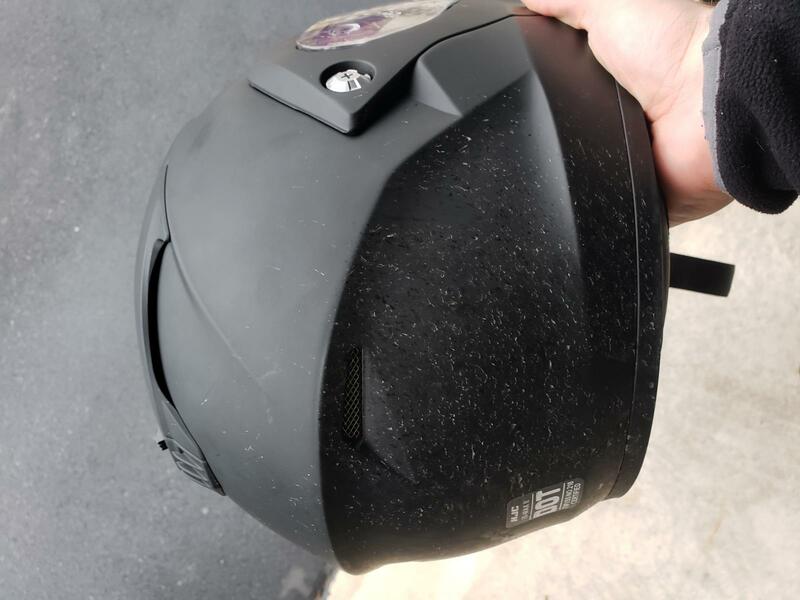 I've attached a picture of my helmet for reference. It had just rained so there was a ton of water on the ground, but it wasn't currently raining. Ando and ozcomz like this. I'm thinking that splash guard might be a pretty sweet solution to the problem. I'm a combination of "don't ride in the rain" and "accept that riding in the rain will result in a gear scrub-down and re-conditioning session". If you plan to ride rain or shine I'd use an axle mounted fender on similar to the one you linked. Perfect combination of not giving yourself a skunktail and having a clean looking bike. If you opt to cut your losses and put the OEM fender back on you can expect to stay clean, it was designed to stop roost, that's why it's so huge to begin with. I did a fender eliminator pretty much 5 days after I bought the bike. I rode in wet conditions for the first time and the back of my bike, helmet, and jacket got covered in mud. I've got to wonder, is this because of the fender eliminator? What did you think the purpose of that fender was? I doubt Kawasaki (or anyone for that matter) would spend extra money on materials for something to just look stupid. TL;DR; Fender is big and ugly, but it's intent is to keep the rain/road muck off your back. I doubt Kawasaki (or anyone for that matter) would spend extra money on materials for something to just look stupid. But that really just proves that "stupid" is a matter of perspective. BTW thanks Kaw'ee for the note on legality. Does the law refer to motorcycles specifically or just fenderless vehicles in general? A rock thrown from a fenderless Jeep is going to do a lot more damage than the muddy water coming off my street tire. Not that the police care if they are in a bad mood and want an easy ticket. Had to google.. maybe not, could not find a motorcycle specific fender law ? It's always been a issue with my 4x4's so assuming it is ! I've never really understood this requirement, especially on a motorcycle. I assume it's in place to better protect parked vehicles, or more likely, stranded vehicles on the side of the road. But has effectiveness actually been proven or was it just made law because "it sounds like a good idea"? It's ugly and I removed it. Otherwise my stock turn signals make my fender eliminator legal based on your list. =] Anyone know if those reflector bolt caps are actually big enough to satisfy the reflector requirement? Just about ready to rip off the front amber reflectors too. These actually DO help a parked bike not get hit, but they are like 6" off the ground, limited effectiveness anyway. I ride an m1200 everyday rain or shine, the first mod I did was to eliminate the fender same as on my z125 I just bought about a month ago. if you ride in the rain and get wet in the front, what's the difference getting a "wet back". I like the looks over function. 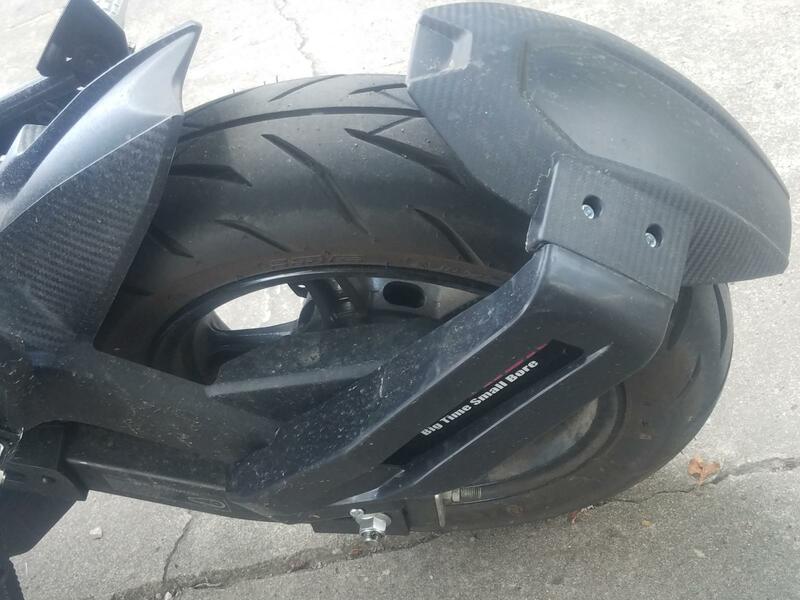 I installed this fender I found on E bay listed for a Grom. I have been running it for about a year now works perfect at keeping the grim off your back.